Adriana C. Vazquez, co-founder and CEO of Lilu, was pursuing her master’s degree in Product Design when she started to see more friends juggle breastfeeding and work. From ex-colleagues, to professors and fellow students in her master’s program—some of whom are experts in robotics and engineering—they all agreed pumping was a miserable experience. Vazquez wanted to dig deeper and understand what mothers thought could be improved or changed, and so with a friend, she sent a survey to a handful of moms, and overnight she had over 500 responses with one common thread—that pumping was an unexpected challenge. That’s what moved the entrepreneur into wanting to improve the breast pump experience. Along with her co-founder, she dug into literature, did hundreds of interviews with moms, doctors and lactation consultants, and eventually they formed a strong hypothesis around the benefits of breast massage while pumping—existing research along with evidence from doctors and moms, all indicated that a big reason why many mothers struggle to pump enough milk, but don’t have issues if they were to feed directly from the breast—is that massage and breast compression are a key stimulus babies need when nursing, but that pumps simply don’t have. Vazquez set out to drastically increase the efficacy of breast pumps. 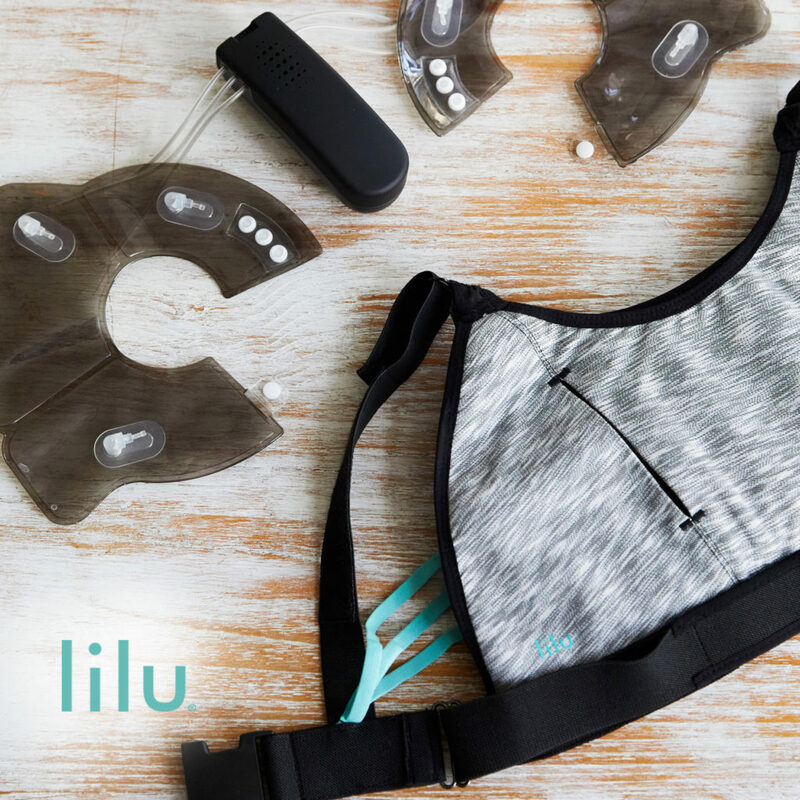 To do that, they had to fundamentally rethink how breast pumps work—and gradually that led them to design the first hands-free pumping bra that automates breast massage: the Lilu massage bra. Companies like Willow and Elvie have developed smart and discreet breast pumps. These are big leaps on the design front, but they still only use suction technology to extract breastmilk. Vazquez said these pumps miss the key element of breast compression so moms still don’t have pumps that are truly as effective in removing breast milk as they could be. “We are starting to see other companies beginning to develop pump accessories focused on massage, vibration and compression (like La Vie, Uboost or Imalac) – but these tend to be less holistic solutions than ours, because they either don’t provide bottle support, or don’t do massage of the entire breast or both breasts simultaneously, or aren’t as portable as ours,” said Vazquez. Vazquez laser focused on making a product that was effective, convenient, and a beautiful design—because Moms deserve more. She sees this as a growing category. “The easier and more comfortable we can make it to pump, the more moms who will be able to reach the twelve months of breastfeeding recommended by the WHO, so I think we’ll continue to need and see innovative products—and we, of course, want to be at the forefront of that innovation,” she added. Moms are returning to work within four months of giving birth but are also opting to breastfeed. There’s enormous pressure on them to breastfeed, making pumping a reality for most new moms in the United States. Vazquez said Lilu has given her the opportunity to observe the colossal endeavor that many women must go through to do what’s best for their family: be both caretakers and financial providers. She is in admiration for women in general after hearing from hundreds of moms about what they’ve had to do, and must put up with to do something as natural as it is to feed a six-month-old. From inflexible schedules, to unsupportive coworkers and terrible amenities to pump— how can we expect moms to both breastfeed for twelve months and work as if nothing has changed in their life? “It’s a lot of work to make pumping work—but the barriers to make it work are too high now. And imagine, this is just in the scope of pumping and breastfeeding. For a new parent, this is just one of many aspects of life, one that should be simple, respected, and supported—and it’s not,” Vazquez told us. The United States is one of the few countries with unpaid maternity leave—and one of the shortest ones. But it takes at least a year to recover physically and emotionally from birth (which many people may not want to hear). Vazquez said we need to be having these conversations so that people can really rethink how our community can support working moms, and technology is one aspect (which is what Lilu is all about), but we are going to need cultural, legislative and educational changes to create a culture in which most women can truly thrive both in their careers and family choices. “Every phase in the development cycle has brought a different challenge, but something that has allowed us to continue pushing forward through different challenges is the extensive user research we did from the onset,” said Vazquez. Having heard the strong emotions moms expressed about how challenging and painful they found their current options, that’s what moved me into wanting to improve the breast pump experience.” It’s what keeps her going. And when they hear from moms who’ve pumped with Lilu and it’s really made a huge difference for them, and therefore their babies, they know that what they’re doing is truly worth it. That’s been important because developing a hardware product is expensive and it takes a lot of time. Setting up a supply chain, finding the right manufacturers, etc. is really time consuming. Vazquez said what has been crucial is to learn to parallel process, be lean and move as fast as possible, but to also be patient when they need to because mistakes in hardware are very costly not only financially but also in terms of time. “We’re super excited to reach a stage where we can launch our product and target moms who are in their last trimester or who just had their babies—and know that we’ll be able to bring the product to them right at the time they need it most,” she added. Vazquez met her co-founder Sujay at the University of Pennsylvania in a robotics lab. It was there that they built the first prototypes of what would become the Lilu Massage Bra. And it was there that they found a vast network of sponsors and supporters for their idea—the first 30 beta testers were from the Philly area—moms that even drove upwards of an hour to try their Frankenstein bras. That’s also were they cemented some of the strongest relationships they have with medical experts, like Dr. Diane Spatz, director of the Lactation Program at the Children’s Hospital of Philadelphia, and Dr. Ari Brooks, director of the Breast Center at Pennsylvania Hospital. They believed in the idea in the very early days, before Lilu even built those initial prototypes; they knew the benefits of breast massage but also knew how impractical it is for moms to have to do it on their own. And finally, Philly has a thriving startup ecosystem, especially in the health tech space—Dreamit health, an accelerator focused in the health space, was another one of their early supporters with headquarters here. “For us, it was the perfect place to begin our venture — and our strong ties to the city keep bringing us back there for crucial initiatives for the company, such as a clinical trial we’ll be running later this year with the support of our medical advisors in Philadelphia,” said Vazquez. In the next five years, their goal is for Lilu to become a nationally recognized, multi-product brand and leader in post-natal care for moms. Their focus for the next year will be to expand Lilu’s online presence as moms are actively looking for solutions online, especially once the baby is born. “In two years after this initial product launch, we feel confident we can expand our product portfolio—and we’d also like to go for global markets. We’ve spent quite a bit (of time) in Asia and learned how breast massage for breastfeeding is much more known about there, so we’re excited about exploring channels there,” added Vazquez. To do all these things, they’ll need to grow their team (currently they’re a team of three). Lilu wants to have more people join to pursue different channels, grow their brand presence on and offline, and to continue to develop amazing products for mothers. Vazquez said one of the most rewarding parts about building this company, besides the product and technical innovation, is also being able to raise awareness about the challenges and pressures that new mothers face so that hopefully more people come up with supportive programs and solutions. “Being a great mom shouldn’t jeopardize a high-growth career or vice versa—and if we want to see more women at the highest levels across different industries, supporting women at such a crucial period in life for women as returning to work post-becoming a new mom should be a priority for society,” she concluded.